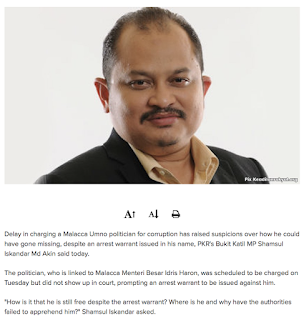 27 April: YB Shamsul Iskandar may have been shooting blanks ever since his giant-killing feat at the 2013 general election, when he defeated the then Malacca Chief Minister Ali Rustam. But with the 14th GE just around the corner, friends of the PKR Vice President said that the draught is about to end. And if current Malacca Chief Minister Idris Harun is not careful, his scalp could end up on Shamsul's plate! Shamsul on attack, attack, attack mode! I glad you've become your good old self, Dato... outspoken for the sake of integrity. But please... be frank with everybody else, especially those in the corridors of power.